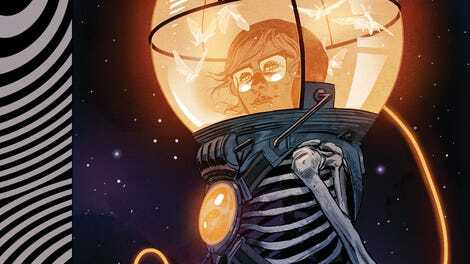 In the pages of Euthanauts, death is something to be celebrated rather than mourned. This new series from IDW’s Black Crown imprint has writer Tini Howard, artist Nick Robles, and letterer Aditya Bidikar venturing into the vast frontier of death, a territory ripe for exploration by those brave enough to leave their living bodies behind. Euthanauts #1 (IDW) introduces readers to Thalia Rosewood, the receptionist of a funeral home whose obsession with death makes her a prime candidate to join the titular group of adventurers, whether she wants to or not. This first issue is intentionally disorienting, making the reader feel Thalia’s confusion and anxiety as she’s unknowingly brought into the Euthanauts thanks to a mysterious dying woman smacking her over the head with an oxygen tank. There are a lot of questions posed here, setting up a compelling, ambitious sci-fi story that looks at death as the start of a new journey as opposed to an ending. There’s a strong story hook, but the emotional content could use more development. Thalia’s character isn’t very defined at this early point, and her relationships with the people around her are purposefully shallow, reflecting her disinterest in the people she calls friends. Ideally she’ll gain stronger connections with her new cohort, and Howard’s past work suggests that this series will gain more heart to go with its off-kilter high concept. Howard is moving in a very different direction than her previous Black Crown series, Assassinistas, a comic that juggles family drama, over-the-top violence, and dark humor. Gilbert Hernandez’s artwork—inspired by classic comic strips, Archie, and the Silver Age superhero masters—gives Assassinistas a light, breezy energy, but Robles’ art on Euthanauts is darker and more modern, experimenting with page design and panel layouts to heighten the metaphysical elements of the story. The opening pages of the issue contrast somber funeral preparations with a joyful party in front of a burning pyre, kicking off the story by highlighting the exciting opportunity of traveling to the other side. Robles’ artwork is the main star of Euthanauts #1, creating evocative environments and memorable characters with crisp detail that doesn’t sacrifice expression. His coloring plays a huge part in that, setting the mood in each scene while heightening tension through contrast. He makes especially strong use of warm and cool colors, using a glowing amber to indicate the warmth of Thalia’s living body in the chilly landscape of the dead. Thalia’s blunt force trauma to the head is depicted in a striking splash page that has glowing amber moths flying around her body as the teal bathroom tiles disassemble beneath her, signifying her shift from one state of being to the next. This transition into the immaterial world dramatically changes panel layouts, and Bidikar’s lettering plays an essential role in guiding readers through pages that have images flowing freely into one another without defined borders. The most thrilling aspect of this series is seeing how Robles depicts the dead dimension, and as Thalia goes deeper into this new frontier, there are even more opportunities for Robles to experiment.